TWIC organises two conferences a year to bring together individuals interested in wildlife recording and conservation from across the region. A series of talks are delivered around a conference theme and there is a chance to promote local recording initiatives through displays and open-mike sessions. Reports from previous conferences and some presentations or summaries of talks can be found here. The TWIC Spring Conference is a chance for recorders to get together at the start of season to share news and to enjoy an interesting programme of talks. 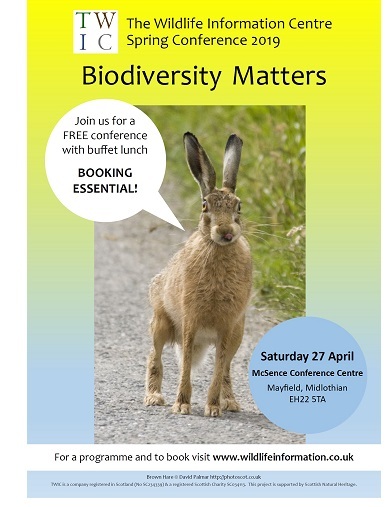 This time our programme is centred around key themes in the new Midlothian Local Biodiversity Action Plan, such as pollinators, people and nature, wildlife corridors, homes for wildlife and protected sites. However, the talks will not necessarily be geographically specific to Midlothian. The conference is free to attend and includes buffet lunch, but BOOKING IS ESSENTIAL. To view a draft programme and to book please visit Eventbrite. If you would like to promote your own survey or recording initative at the conference, please indicate this when you register. Deadline for booking is midnight, Sunday 21 April 2019. A flyer for the event can be downloaded here [PDF, 1 page, 380 KB] and the programme here [PDF, 1 page, 93 KB].